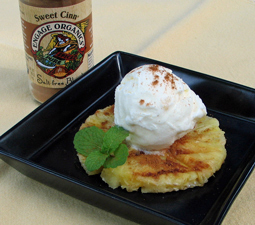 Sweet Cinn Pineapple with Coconut Ice Cream - A recipe from Savor California, the online showcase for extraordinary gourmet foods and beverages from California. Dust with Engage Organics Sweet Cinn Spice Blend. Top with a scoop of coconut ice cream. Dust the ice cream with Sweet Cinn.